Thomson is the father of Nobel laureate George Paget Thomson. 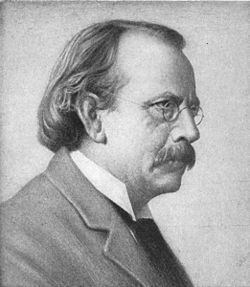 Sir Joseph John “J.J.” Thomson, OM, FRS (December 18, 1856 – August 30, 1940) was a British physicist and Nobel laureate, credited with the discovery of the electron, the isotope, and the invention of the mass spectrometer. He was awarded the 1906 Nobel Prize in Physics for his work on the conduction of electricity in gases. J.J. Thomson was born in 1856, in Cheetham Hill, Manchester in England, of Scottish parentage. Thomson's father was a successful bookseller, and this no doubt was in part responsible for Thomson's interest in science, as he would have had access to innumerable volumes devoted to the subject. Thomson was slated for a career course in engineering, but the death of his father blocked arrangements for him to enroll in an apprenticeship. This set Thomson on an academic track. Through a series of small scholarships, Thomson was able to enter Owens College, Manchester, where he studied engineering. He was later primed by his mentors to enter Trinity College, Cambridge, on a mathematical scholarship. He was accepted at Trinity in 1876, and was coached there by one of the foremost tutors of British scientists at the time, E.J. Routh, for the formidable tripos examinations, in which he placed second. He also earned second place in the competition for the Smith's prize. During this period, he worked under William Strutt, Lord Rayleigh, on the accurate determination of electrical standards. In 1880, he obtained his bachelor of science degree in mathematics, and won a fellowship at Trinity in 1881. During this period, Thomson worked on the development of the vortex theory of the atom proposed by William Thomson, Lord Kelvin. Kelvin had demonstrated that in a frictionless fluid, a circulating vortex would have permanent stability. Thomson built up a model based on concentric vortices, and linked this model to chemical phenomena with some success. He also developed a way of replacing the potential energy in a system of bodies with the kinetic energy of fictitious masses, and explored ideas on the flow of electricity. Perhaps of more lasting value during this period was his discovery of electromagnetic mass, which later formed the basis for relativistic dynamics. Thomson embraced the field theories of James Clerk Maxwell, and through the device of "tubes of force" connecting electrical charges, was able to deduce equations for electromagnetic momentum in otherwise empty space. Thomson earned a master's degree in 1883. The following year, Lord Rayleigh resigned the chair of experimental physics at the Cavendish Laboratory, which generated a major competition for the post among the brightest of the up-and-coming generation of British physicists. Contenders included George F. Fitzgerald, Joseph Lamor, Osborne Reynolds, and Thomson. Thomson won this competition, and would head the Cavendish Laboratory for the next next 35 years. In 1890, Thomson married Rose Elisabeth Paget, daughter of Sir George Edward Paget, a physician and then Regius Professor of Physic at Cambridge. The couple had a son, George Paget Thomson, and a daughter, Joan Paget Thomson. G.P. Thomson later became a noted physicist in his own right, winning the Nobel Prize himself for demonstrating the wavelike properties of electrons. In the 1890s, Thomson and his research associates at the Cavendish turned their attention toward the understanding of electrical discharges in gases and in a vacuum. William Crookes and Philipp Lenard had already produced evacuated glass vessels with anodes and cathodes to study streams of rays produced at the cathodes of their devices. These cathode rays were believed by some scientists to be similar to light, while others suspected that they were streams of particles with a negative electrical charge. In 1895, Thomson published research with Ernest Rutherford, who had joined the Cavendish as a post-doctoral student, on the behavior of ions in a gas subject to an electrical field. In 1897, Thomson published the results of a series of experiments meant to confirm the particulate nature of cathode rays and to compare its charge and mass to that of electrically charged gas molecules, or ions. The results of Thomson's investigations pointed to a negatively charged particle that was some 1,000 times less massive than a hydrogen molecule, if, indeed, the charge of the particle was the same as that carried by a hydrogen ion. This had yet to be substantiated, however, and as only the ratio of the two variables was obtained, there was some doubt about the conclusions drawn regarding the particle's mass. In the experiments, Thomson was able to show that cathode rays were deflected in the presence of an electrical field, a result that had shown a null effect in previous experiments by other investigators due to their inability to achieve a good enough vacuum. By deflecting a stream of cathode rays with a magnet, Thomson could measure the ratio of the electric charge to the mass of the cathode ray particles. He compared this ratio to the ratio of charge to mass of ions in electrolysis. In 1898, Thomson devised an experiment for measuring the charge of the "electron," as these particles were later called, thus removing any doubt about the relatively small mass of the electron compared to the hydrogen atom. Then, in 1899, he measured the charge of electrons produced by the photoelectric effect. These series of experiments, along with those of other scientists, lent decisive weight to the contention that electricity is corpuscular in nature, with each elementary particle of electricity having a specific mass and charge. Thomson was awarded a Nobel Prize in 1906, for his work on the conduction of electricity in gases. In the same year, he demonstrated that hydrogen had only a single electron. Previous theories allowed various numbers of electrons. He was knighted in 1908, and appointed to the Order of Merit in 1912. In 1914, he gave the Romanes Lecture in Oxford on "The atomic theory." Thomson, who had been elected a fellow of the Royal Society in 1884, held the presidency of the Royal Society from 1916 to 1920. In 1918, he became Master of Trinity College, Cambridge. A year later, he resigned his post at the Cavendish, and was succeeded by his former student, Rutherford. While still master of Trinity, he died on August 30, 1940, and was buried in Westminster Abbey, close to Sir Isaac Newton. Thomson conducted a series of experiments with cathode rays and cathode ray tubes leading him to the discovery of electrons and subatomic particles. Thomson used the cathode ray tube in three different experiments. In his first experiment, he investigated whether or not the negative charge could be separated from the cathode rays by means of magnetism. He constructed a cathode ray tube ending in a pair of cylinders with slits in them. These slits were, in turn, connected to an electrometer. Thomson found that if the rays were magnetically bent such that they could not enter the slit, the electrometer registered little charge. Thomson concluded that the negative charge was inseparable from the rays. In his second experiment, he investigated whether or not the rays could be deflected by an electric field (something that is characteristic of charged particles). Previous experimenters had failed to observe this, but Thomson believed their experiments were flawed because they contained trace amounts of gas. Thomson constructed a cathode ray tube with a practically perfect vacuum, and coated one end with phosphorescent paint. Thomson found that the rays did indeed bend under the influence of an electric field. In his third experiment, Thomson measured the charge-to-mass ratio of the cathode rays by measuring how much they were deflected by a magnetic field and how much energy they carried. He found that the charge to mass ratio was over a thousand times higher than that of a hydrogen ion, suggesting either that the particles were very light or very highly charged. Thomson's conclusions were bold: Cathode rays were indeed made of particles which he called "corpuscles," and these corpuscles came from within the atoms of the electrodes themselves, meaning the atoms were, in fact, divisible. Thomson imagined the atom as being made up of these corpuscles swarming in a sea of positive charge; this was his plum pudding model. This model was later proved incorrect by Ernest Rutherford. His discovery was made known in 1897, and caused a sensation in scientific circles, eventually resulting in him being awarded a Nobel Prize in Physics in 1906. In the bottom right corner of this photographic plate are markings for the two isotopes of neon: neon-20 and neon-22. In 1913, as part of his exploration into the composition of canal rays, which moved from the anode to the cathode of a cathode ray tube, Thomson channeled a stream of ionized neon through a magnetic and an electric field and measured its deflection by placing a photographic plate in its path. Thomson observed two patches of light on the photographic plate (see image on right), which suggested two different parabolas of deflection. Thomson concluded that the neon gas was composed of atoms of two different atomic masses (neon-20 and neon-22). This method of differentiating between different substances by virtue of their mass is known as mass spectroscopy, and Thomson is often credited with its invention. J.J. Thomson is a name that will always be connected with the "discovery" of the electron. Yet, others had done research similar to that of Thomson and came to many of the same conclusions before he did. The name "electron" was not given by Thomson himself, but by George Johnstone Stoney, in 1894. Stoney had concluded that electricity must have a particulate nature, based on electrochemical studies. That Stoney's electron and Thomson's particle of electricity were identical soon became evident, and Stoney's name was used for Thomson's discovery too. Thomson had the insight to understand the run of experiments that were required to pin down the particulate nature of electricity, which is why he was given much-deserved credit for the discovery. Yet, he was as good a mentor as he was a scientist, and perhaps his best student was Ernest Rutherford, who went on to make many discoveries of his own. The chain of investigation linking one generation of scientists with the next is an important but generally overlooked characteristic of the scientific method. ↑ Davis and Meurig, 312. Thomson, G. P. 1965. J.J. Thomson and the Cavendish Laboratory in His Day. Garden City, N.Y.: Doubleday. Thomson, J.J. 1921. Rays of Positive Electricity and Their Applications To Chemical Analysis London: Longmans Green. Thomson, J.J. 1897. Cathode rays. Philosophical Magazine. 44:293. Retrieved December 12, 2007. Thomson, J.J. 1913. Rays of positive electricity. Proceedings of the Royal Society. A89:1-20. Retrieved December 12, 2007. Thomson, J.J. 1904. On the Structure of the Atom: an Investigation of the Stability and Periods of Oscillation of a number of Corpuscles arranged at equal intervals around the Circumference of a Circle; with Application of the Results to the Theory of Atomic Structure. Philosophical Magazine. 6:7:39. Retrieved December 12, 2007. Trinity College. The Master of Trinity. Retrieved December 12, 2007. The Discovery of the Electron. Annotated bibliography for Joseph J. Thomson from the Alsos Digital Library. Essay on Thomson life and religious views. History of "J. J. Thomson"
This page was last modified on 11 March 2018, at 23:58.